Weekly Happenings: Not too much out of the ordinary happened this past week. We had story time, play dates, grocery shopping, etc.. Paul had work and scouts (I believe he starts his next semester this week). 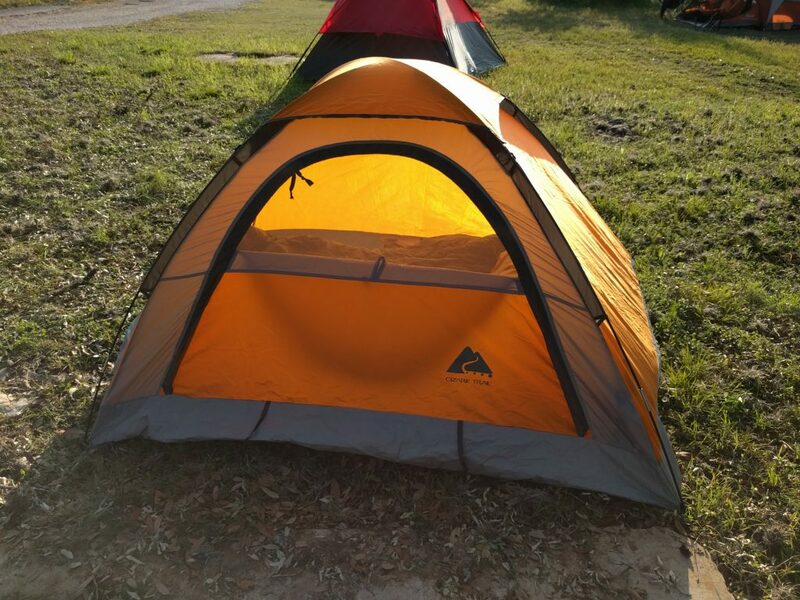 On Friday night, Paul went to an Introduction to Outdoor Leadership Skills overnight camp out, where he and other Scout leaders learned more about the different skills to teach the boys on camp outs. Joseph and I fended pretty well for ourselves except for the fact that yesterday morning he woke up with a high fever, saying that his throat hurt. Since strep has been going around, I went ahead and took him in to urgent care. Sure enough, he’s got it. So, we’ve got some antibiotics for him and he’s well on the road to recovery. The Weekly Weather: We had a major storm come through on Tuesday night that dropped baseball-softball sized hail. Yup, you read that correctly. Luckily, it seems like our house is okay (though we still need to take a look at the roof to make sure we didn’t miss anything). Some of my friends have major damage to their homes and there are a lot of cars with hail damage (luckily ours were both in the garage). Some businesses in Helotes (the town near us) sustained major damage when the hail came crashing through their skylights, making it rain not just water, but glass as well, onto unsuspecting shoppers. The rest of the week after that was sunny with a few storms here and there. 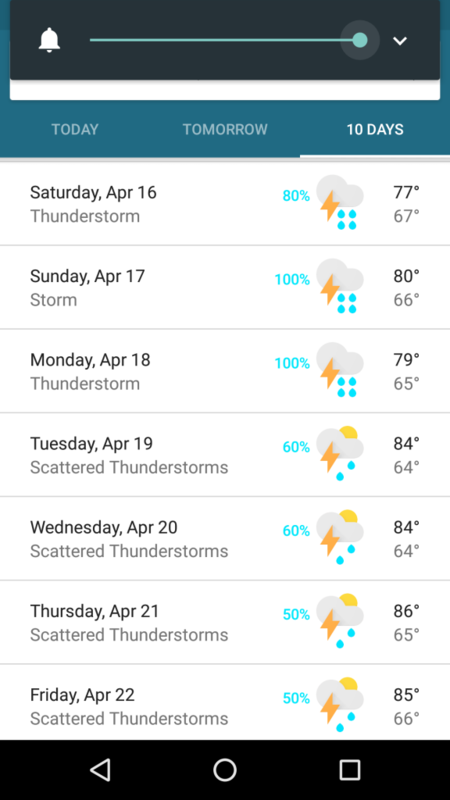 We’re supposed to get thunderstorms all this next week, so it’ll be interesting to see what transpires. That’s spring in South Texas! What Paul’s Been Up To: As mentioned before, not too much out of the ordinary. Work, scouts, and getting ready for another semester of school. What Sarah’s Been Up To: Not too much on my front, either. I did play my flute in church today. It was an arrangement of “Be Still My Soul” that was written for piano and two violins (which is easy to have flutes play, as long as the notes don’t go too low, and if they do, it’s easy to switch out for a different note). It was me, a friend of mine playing the second flute/violin part, and our dear, trusted accompanist (also a dear friend). It turned out beautiful! What Joseph’s Been Up To: He has been his normal, crazy self, for the most part. He slowed down a bit yesterday, when he was feeling sick, but now that the antibiotics are kicking in, he’s feeling quite a bit better. He did rather well at the doctor’s yesterday. He willingly opened his mouth for the rapid strep test (which, I think, is a first for him…usually the nurse has to practically pry his mouth open). While waiting for the doctor, the nurse gave him this special paper and a plastic “pen” kind of shaped like a small butter knife that made marks on the special paper. That kept him occupied the entire time we were waiting for the doctor, and he got to keep it, which made it even better. He also got to pick a toy from the treasure chest at the end (he chose a green jump rope). I appreciate the fact that this urgent care recognizes the fact that kids might be nervous about being at a doctor that is different than their regular one and does their best to put them at ease. I’m also grateful that there are stand alone urgent cares (as opposed to only be attached to large hospitals). Because we have quite a few in our area, they are rarely crowded. It’s not something that I experienced in CA. One funny story about Joseph: earlier last week I was getting ready to help him brush his teeth and he was kind of dancing/wiggling around on his steps in front of the sink. Consequently, his nose ran into the toothbrush I was holding, leaving a bit of bright blue toothpaste on the tip of his nose. I said, “Oops! You’ve got a blue nose!” He answered back, laughing, “Yeah! Like ‘BLUEdolph! '” I burst out laughing, which made him laugh harder. What four-year-old can whip out a different version of a popular name to suit the situation? Joseph can, that’s for sure! 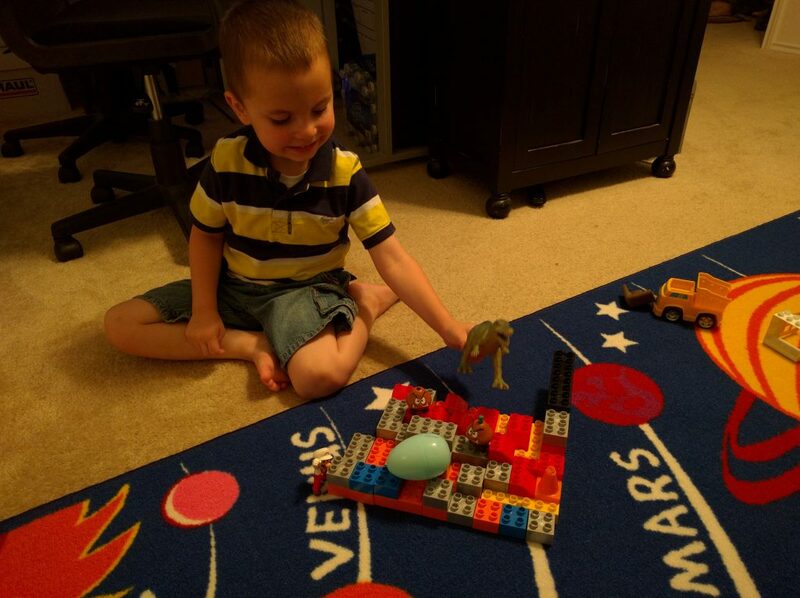 Joseph created Bowser’s castle (from Mario Brothers) out of his Mega Blocks. The T-Rex was clearly Bowser. 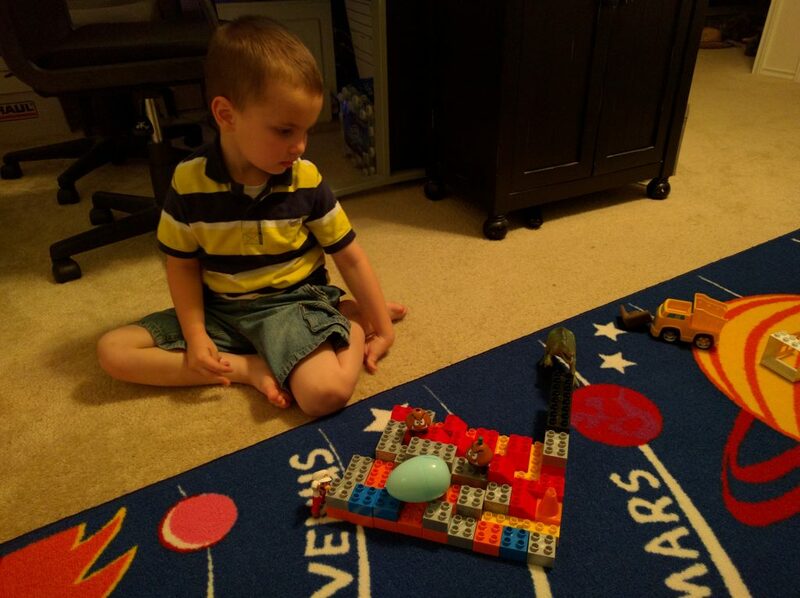 The Easter egg is a Yoshi egg. I love his imagination! 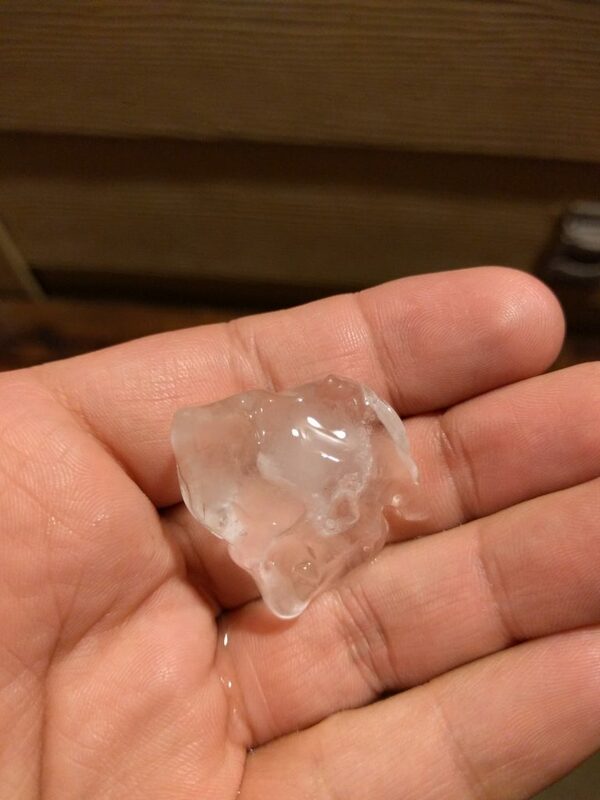 This is a hailstone that Paul went out and grabbed from our yard…half an hour after the storm was over…so imagine how big it was when it first fell! They were crazily shaped, too. Not spherical at all. They were all pokey and jagged. 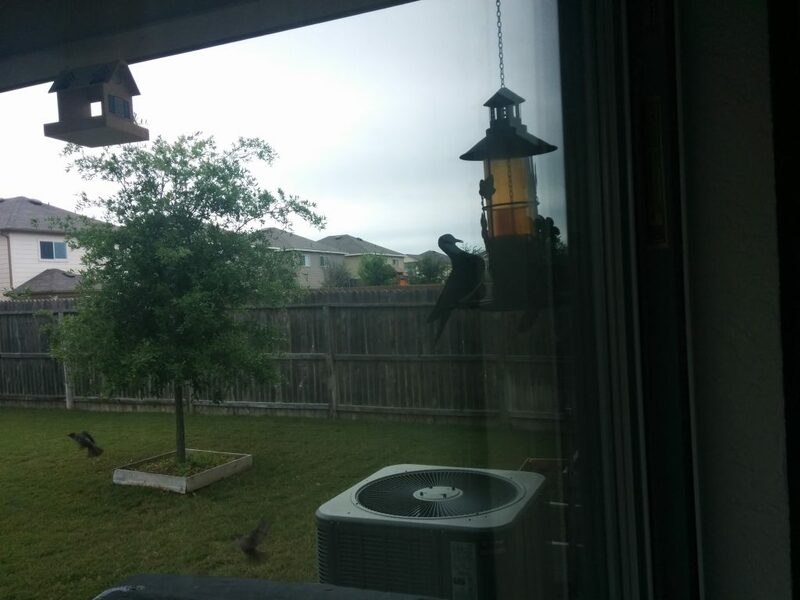 Paul put up Joseph’s bird feeder and filled it up (as well as our other bird feeder). 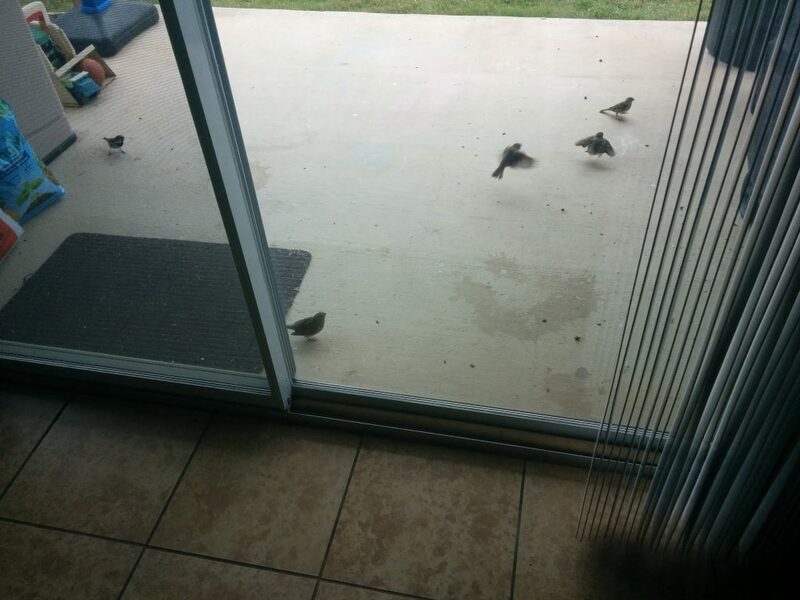 We’ve had so many birds in our yard! We have mostly smaller birds, but we do have a few different varieties of doves that also frequent the feeders. Paul’s set up for his overnighter…that little one-man tent is rather handy. 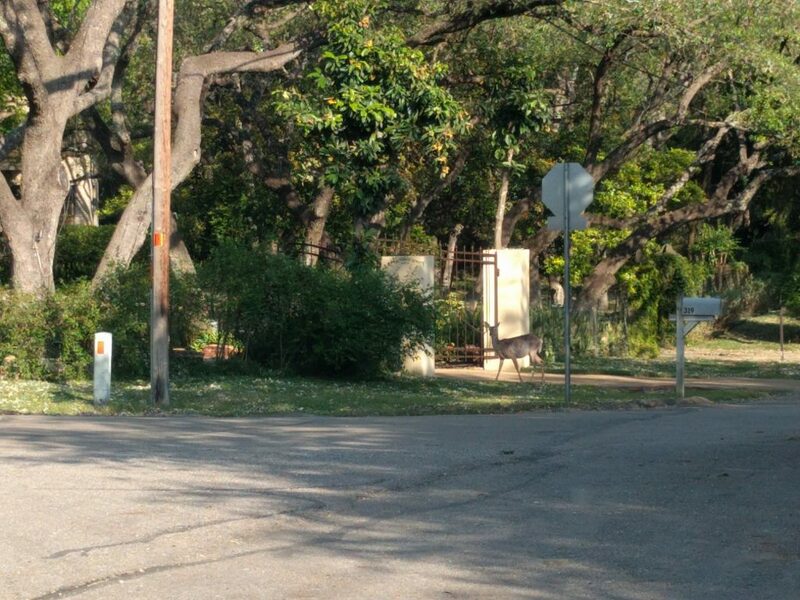 They were camping in a field near the Scout offices, so there are still homes nearby. He spotted this deer. 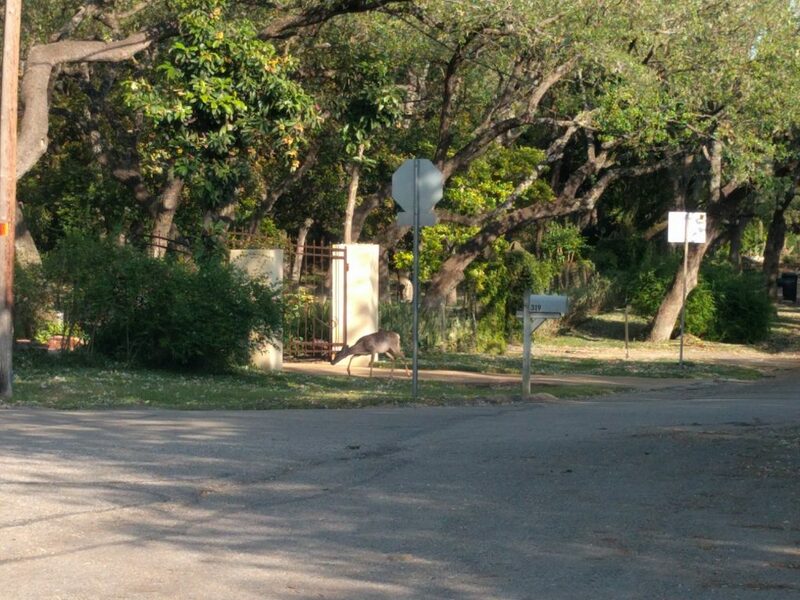 It was just hanging out by somebody’s house. It reminds me that while this part of San Antonio is by no means “country”, it is a bit more rural than the heart of the city, for sure. The projected forecast for this next week. Wee…fun! Hopefully it’s just thunderstorms and no more hail of Biblical proportions (oh, and tornadoes…please, no tornadoes)!